Explicitly teaching clear school-wide expectations based on our school motto of "Respect Self, Others, and the Environment" to all students. Encouraging all staff (teachers, administrators, bus drivers, secretaries, counselors, etc.) to aim for 4 positive student interactions for every correction. Collaboration and implementation of PBIS by all school staff in order to create learning environments conducive to academic learning and achievement. A belief that just like academic learning, students need to be explicitly taught behavioral expectations, need to practice the skills to achieve those expectations, and may require additional opportunities or re-teaching of skills. We do not make the assumption that students automatically understand what we mean when we ask them to "be good." Active supervision and positive interactions by staff during transitions and unstructured activities. 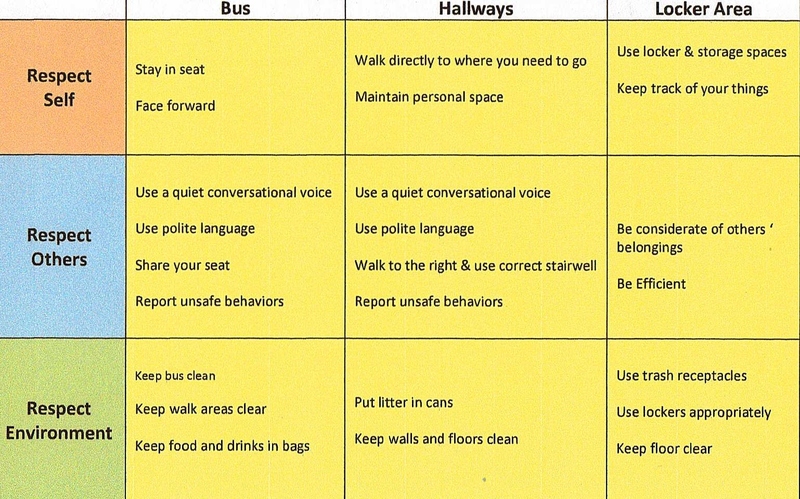 At East Lyme Middle School, we begin the year by teaching the school-wide expectations in all areas of the school: bus, playground, hallway, cafeteria, locker area, etc. Teachers also teach the expectations for their individual classrooms - explicitly demonstrating what the behaviors look like, giving students opportunities to practice, and giving the rationale behind the expectation. Students are given positive recognition when they demonstrate expected behaviors. Positive recognition by the adults working in the middle school can have a tremendous impact on the behavior of students: praise, positive affirmations, smiles, Viking Vouchers, etc.. Viking Vouchers are used to help students who need/enjoy getting a tangible recognition. Some students simply enjoy saving their vouchers; others chose to use their vouchers in school raffles where they can win prizes, be selected to be the announcer during our morning broadcast, win special opportunities for their team, etc. When students are not demonstrating the expected behaviors, adults will conference with students and re-teach the expectation. Conferences are then documented on Behavior Conference forms. Research shows that when PBIS systems are properly implemented and consistently followed, at least 80% of the students will respond positively. All East Lyme Middle School students are a part of the Tier I system outlined above. Students who do not respond as expected require additional interventions and supports in order to be successful. When staff notice that a student has acquired numerous Behavior Conference forms, it is a signal that additional interventions and supports are needed. A team consisting of teachers, guidance counselors, and school psychologists determine what course of action will benefit the student. Tier II Interventions may include an increase in positive adult interactions through a check-in and check-out system, a point sheet designed to not only chart behaviors, but to facilitate positive interactions between each teacher and the student. This point sheet is also created to increase positive parent/child connections. The 5% of students who do not respond positively to Tier II interventions and supports are referred for Tier III services where interventions and supports are increased and become more individualized. The PBIS teams for Tiers I, II, III meet on a regular basis to look at data, assess what aspects are working, and determine areas which need to be refined. Our current PBIS teams include teachers, secretarial staff, parent/cafeteria staff, administrator(s), school guidance counselors, and school psychologists. A core group of staff received training through UConn's Center for Behavioral Education and Research (CBER) with Dr. George Sugai. Next they worked collaboratively on the implementation of PBIS at ELMS and professional development for staff. SERC (State Education Research Center) and LEARN (our Regional Educational Service Center) have continued to help us develop and customize the basic concepts of PBIS for East Lyme Middle School. We highly recommend watching the video "Creating the Culture of Positive Behavior Supports" - A film by Gray Olsen and Paula Baumann, Produced for The University of Oregon and the OSEP Center on Positive Behavioral Interventions and Supports . It gives an excellent overview of the system of Positive Behavior Support and Interventions. Please note that each PBIS school decides how to design and implement its supports and interventions in a way that makes sense for the school and students. Excerpt from the PBIS CTSERC website : Positive Behavioral Interventions and Supports (PBIS) involves a proactive, comprehensive, and systemic continuum of support designed to provide opportunities to all students, including students with disabilities and second language learners, to achieve social, behavioral, and learning success. This is accomplished by examining the factors that impact behavior as well as the relationships between environment and behavior.